I kept some bushfire gardening notes, prepared when I managed the Royal Botanic Gardens, Sydney, after my first taste of fire weather in a hot, parched, windy summer of 1994. “This is the third morning I’ve woken to the smell of bushfire smoke. First thing every morning my dog, George, gets up, goes outside and starts sneezing. Uncontrollably. My sneezy, bleary housemate goes through every handkerchief in the house. Daily. Thick smoke fills the heart of Sydney. The sun, when visible, shines tangerine-coloured light. Hot debris floats down, still smouldering. I’m saving singed Banksia and Smilax leaves that fell into the Palm Grove at Sydney Gardens as souvenirs”. Every season a bushfire season? The spring bushfire season seems to be starting earlier, in late winter. The Queensland Fire & Rescue Service reckon bushfires are ‘natural’. Some are. Many are started deliberately. Indirectly, society is increasing the frequency and severity of bushfires through burning fossil fuels. Increased lightning strike gives our bushfire season a new dimension. Now I live in Brisbane, I can see that urban and peri-urban bushland burns frequently enough – officially and unofficially – to modify the species mix. Frequent fires favour fire-tolerant grasses, like Blady grass, Imperata cylindrica, and introduced ornamental weeds, like common Fountain grass, Pennisetum alopecuroides. These perennials love fire and their growth adds to fuel loads. More frequent fire reduction burning encourages fire-responsive species extend their range and strengthen their grasp. Grasses already have an advantage, they are monocots with a special metabolism that helps them thrive during drought and in our carbon dioxide enriched atmosphere. Research at the F.A.C.E. project, at the University of Western Sydney points to the Poaceae (grass family) becoming Climate Change Winners. Blady grass (and many other introduced weedy grasses) regrowth after a fire is rapid, creating dense swards that block out sunlight at soil level, robbing seedlings of light, nutrients and water, suffocating regeneration as effectively as deep mulch. By choking regenerating shrubby species and other perennials, species diversity of Melaleuca swampland and Eucalyptus-dominated forests around Brisbane is gradually being simplified. Inexorably the shrubs and herbs that should normally create a diverse woodland understorey for a range of animals are being alternately choked and burned out. Eastern Australia’s bushfire season starts in late winter and lasts until summer rains arrive. The Rural Fire Service (Qld) a Prepare, Act, Survive Bushfire information on their website. Wherever you live, it pays to be alert to the dangers of fire. Its effects are devastating and can occur before you see the flames or well after the fire has passed. You don’t need to live near bushland to be affected by bushfires, since sparks and embers can travel great distances. 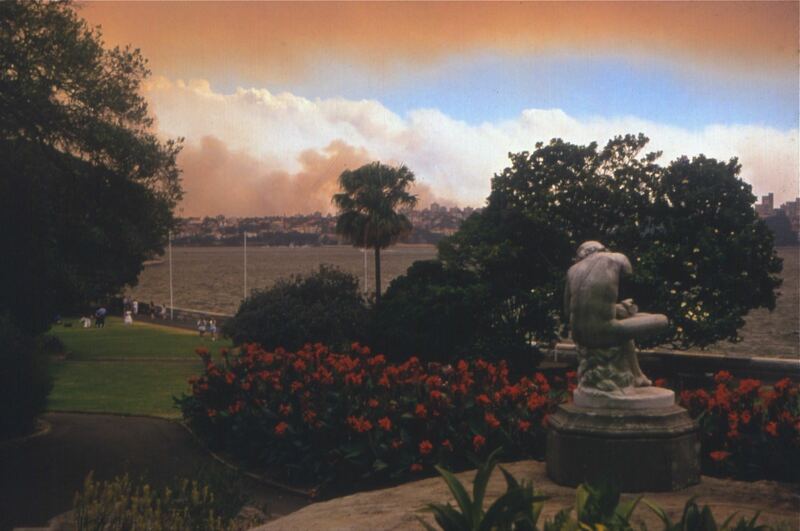 During the 1994 Sydney bushfire, I had native grasses planted around Woolloomooloo Bay and Mrs Macquaries’ Chair brush cut. 13 During total fire bans ensure that you have access to water. Leave hoses connected to taps, and check sprinkler systems are in good working order daily. Some rural local councils mandate that rainwater tank owners conserve a reserve of water solely for firefighting purposes. Does yours? 14 If you store fertilisers, garden chemicals and fuel, bottled gas, or piles of garden debris, including compost heaps and plastic bins, seed trays, crates and plastic pots, move them out from under buildings and away from them. Never store them under the house. 15 What about your neighbour’s garden? Co-operating with your neighbours, especially if they are non-gardeners, might help protect your home or garden from bushfire. Over 300 Sydneysiders die each year from respiratory problems associated with atmospheric pollution, including bushfire. Let’s hope tonight’s fire weather warning is just that: a warning. When cinders fell around Sydney and its population became passive smokers, I felt far more secure living in a sandstone house there and then than now, living in a timber built one in the shaggiest, grassiest capital city in Australia.